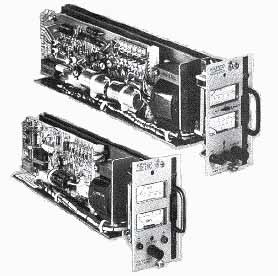 *** Check out Kepco's companion Series PCX-MAT Voltage Stabilizer. Output current is controlled by a panel-mounted, 10-turn rheostat. External control can be exercised by a resistance (0-10,000 ohms controls the current through the selected range), or by a control voltage delivering 0-100µA. Control is fully operational; the power supply acts as an inverting d-c power amplifier with current sensitive feedback to the summing junction. Housings - Cases CA 3, CA 4, and CA 5 provide single, double or triple unit housings for Series CC models. Rack mounting is accommodated by the RA 22-6A and RA 32 rack adapters. Modular versions (without meters) are available; contact Kepco for further details. Connectors are available for connecting 12 terminal edge connector to either barrier strip	or cable connector.